The "bluesea house" is located in Sant'Andrea di Rovereto on the first hill of Chiavari overlooking the sea and the promontory of Portofino. It is a detached house on two floors immersed in the tranquility of the olive trees and with a lovely sea view. It has just been reordered by all my family who adores this house for the peace it offers. I am deeply attached to the place where I was born and where I live. In my spare time I dedicate myself mainly to the care of the olive groves I own in Sant'Andrea di Rovereto. I love the mountain, the sea and especially the cliffs of Liguria and walk in the nature. When I can work the wood and produce small items for my family (earrings and rings for girls, walking sticks for me and my wife, cutting boards for the kitchen...) My two daughters and my wife love nature as I do and this is an incentive to devote myself to our strenuous Ligurian lands. I can not do without my Vespa, my garage full of tools to carry out DIY work and first of all my family "Beauty is at the bottom of simplicity " "The essential is invisible to the eyes "
We enjoyed our stay in this beautiful place!! The owner and family were just wonderful. It really was a magical place to look at the Mediterranean and take in the quiet. Great restaurant close by along with a market to pick up odds and ends. 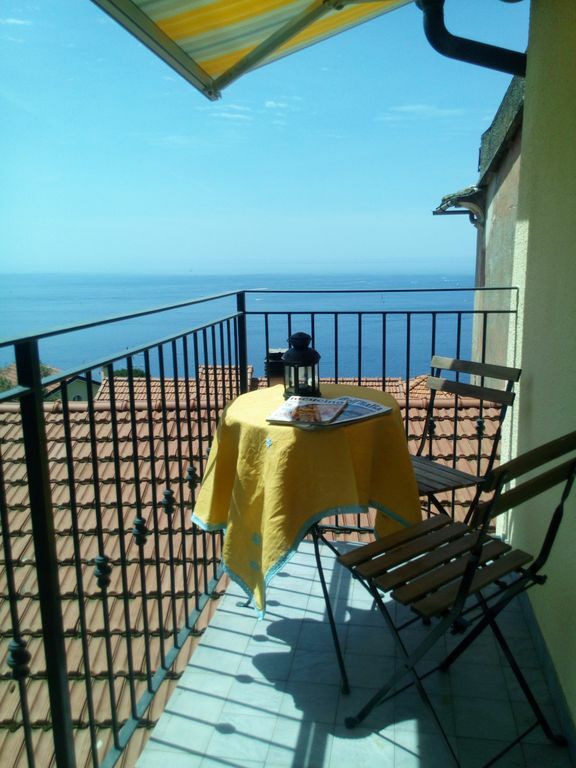 Easy access by bus or train to Porto Fino, Chiavari , San Margarita Liguria and more. Highly recommended for people who are willing to go a little bit out of the way for an amazing experience. Thank you for having stayed in our house and thanks for the attention and the order you left in our house: you are ideal guests! Alles was man gebraucht hat war da (Küche, Bad mit Dusche usw, Bett..). Das Haus ist sehr schön eingerichtet und man hatte eine tolle Aussicht auf das Meer vom Balkon aus. Das Appartment war super sauber und es hatt genug Platz um unser Leben im Urlaub zu genießen. Sauber war es und man konnte kochen wie daheim. Die Wohnung ist wie beschrieben, sie ist sehr sauber und komplett ausgestattet mit guten Geräten. In der oberen Etage ist der Wohn-/Koch-/Essbereich, ein freundlich eingerichteter Raum mit Blick aufs Meer vom Sofa aus. Die Wendeltreppe ist etwas eng, war für uns kein Problem, könnte aber für manche vielleicht eins sein. Die Vermieterfamilie ist sehr freundlich, wir durften unsere Fahrräder in der Garage unterbringen und wurden mit Weintrauben aus eigener Ernte beschenkt. Insgesamt absolute Weiterempfehlung.